Tomorrow’s technology depends on the achievements of today’s engineering students, which is why we at Ferroli are pleased to be able to support them in any way we can. 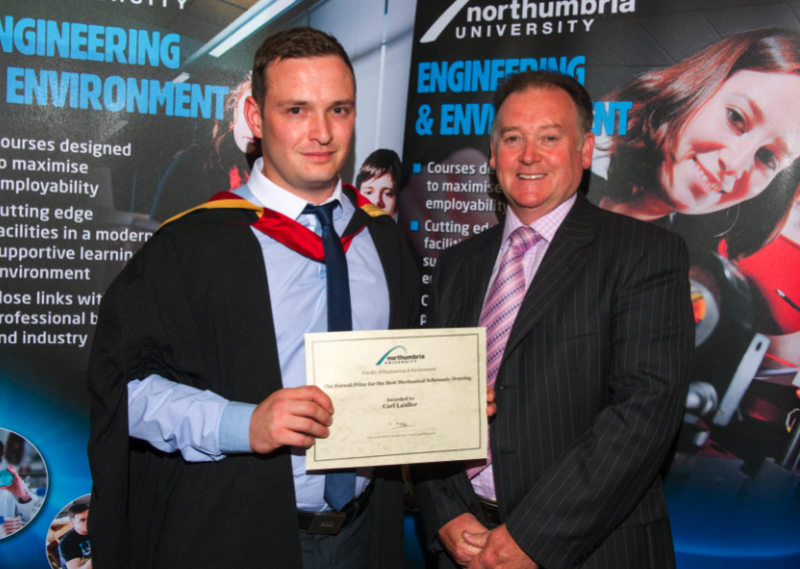 At July’s graduation ceremony for Northumbria University in Newcastle-upon-Tyne, we were delighted to present to Building Services Engineering graduate, Carl Laidler, The Ferroli Prize for the Best Mechanical Schematic Drawing, along with a cheque for £100. Carl, pictured here receiving his certificate from Evans Reid, Ferroli’s agent for Scotland & the North East, is now employed as a consultant engineer with Desco in Sunderland. The Building Services Engineering course covers the design of all the vital systems that are necessary in a building, including heating and ventilation, and helps to equip students with the skills needed to qualify for Corporate Membership of the Chartered Institution of Building Services Engineers (CIBSE).